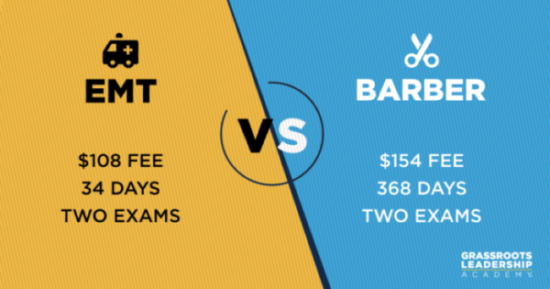 Can You Guess Which Licenses Are More Onerous to Get? Some states require people to be licensed in order to do a job. But often the amount of time and money it takes to get an occupational license doesn’t make much sense, considering the occupation. For example, did you know that to work as a florist in Louisiana you have to pay $189 to obtain a license? No other state requires florists to have a license — but licensing laws in general tend to be arbitrary and nonsensical. Emergency medical technicians are responsible for assessing injuries, administering emergency medical care and transporting injured or sick people to medical facilities, among other duties. Barbers provide services such as cutting, trimming, shampooing and styling hair, trimming beards, and shaving facial hair. Which profession has, on average, the most burdensome occupational licensing requirements? On average, it is more burdensome to obtain a license for a job as a barber than it is for an EMT. Interior Designer or Pharmacy Technician? Interior designers plan, design and furnish interiors of residential, commercial or industrial buildings using designs meant to help reach a goal, such as raising productivity, selling merchandise or improving lifestyle. Pharmacy technicians prepare medications under the direction of a pharmacist. They may measure, mix, count out, label and record amounts and dosages of medications. 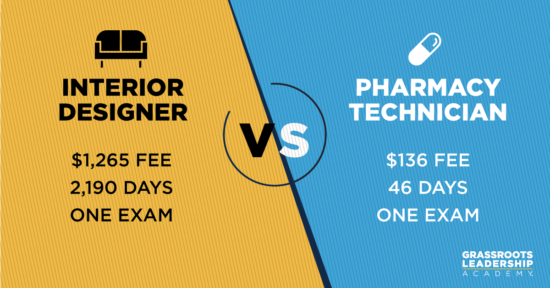 On average, it is more burdensome to obtain a license for a job as an interior designer than it is for a pharmacy technician. A shampooer works in a beauty salon or barbershop and is responsible for shampooing and conditioning clients’ hair. Dental assistants set up equipment, prepare patients for treatment and keep records. 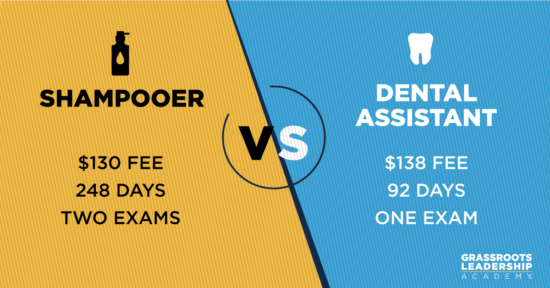 On average, it is more burdensome to obtain a license for a job as a shampooer than it is for a dental assistant. Cosmetologists and hair stylists provide beauty services, such as hair care, skin care, nail care and makeup application. Crane and heavy machine operators operate mechanical boom and cable equipment to lift and move materials, machines or products in many directions. 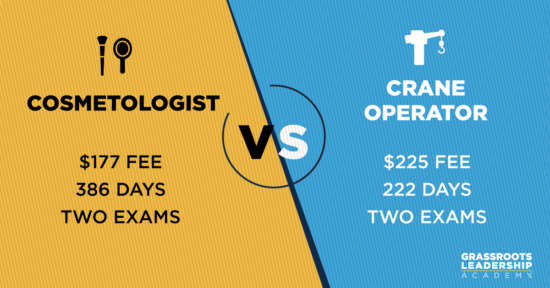 On average, it is more burdensome to obtain a license for a job as a cosmetologist than it is for a crane operator. So, how did you do? Did you guess correctly? If you’re surprised by the answers, you’re not alone. It just goes to show how arbitrary licensing laws can be. Occupational licenses are barriers to opportunity that are used more often to help squash competition than to protect the public. 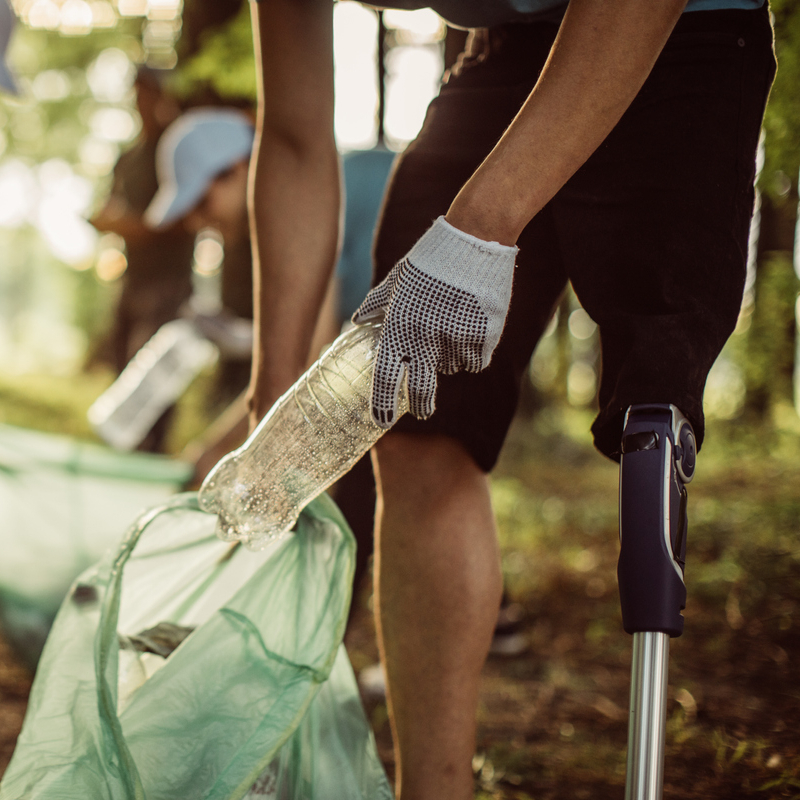 At Grassroots Leadership Academy, we take a closer look at this important topic in our Insight to Action – Problems of External Barriers: Occupational Licensing. 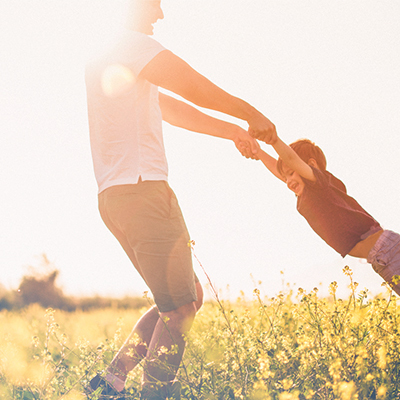 Find out if this session is coming to a city near you and sign up for our email list here. You can also make a request for us to bring this session to your group here.